Omega Steel is home of the heavy walls and oddballs. With over 30,000 tons of inventory in Saint Louis, Houston, and Baton Rouge, Omega Steel is strategically located to service the entire country's carbon steel pipe, structural steel pipe and line pipe needs. We think you will find that Omega Steel has the tools, knowledge, and products to help you complete your project on time and under budget. Please contact us for your next carbon steel pipe, structural steel pipe or API line pipe project. Thank you in advance for giving us the opportunity to earn your business! 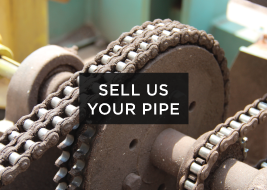 Contact us when you need carbon steel pipe or structural steel pipe.